1 Remove the outer leaves and wash the cauliflower well. Cut the florets at the base, where they meet the stalks. You can cut them again if you want pieces that are smaller. Cut off any brown colouration on the edges. 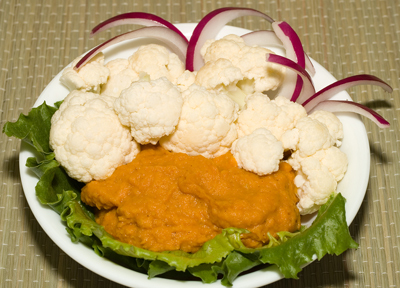 2 Arrange the pieces on a plate around a serving of Curried Carrot Dip (see below). 1 Cook the carrots in a covered medium saucepan in a small amount of boiling water for about 10 minutes or until tender. 2 In a small skillet, cook the chopped onion and minced garlic in the oil until soft but not brown. Stir in the curry powder and cumin. 3 Blend the carrots and the onion mixture in a food processor until smooth. 4 Place the mixture in a bowl. 5 Purée the white beans in a food processor until smooth. Add them to the bowl with the carrot/onion mixture. Mix well. 6 Cover and chill until ready to serve with the cauliflower. Cauliflower will keep for up to five days if stored in the crisper section of the refrigerator. This healthy combination of carrots and beans provides a good mix of protein from the beans and vitamin A and other micronutrients from the carrots. It serves well as a dip for vegetables or as a spread for Melba or whole-wheat toasts. Younger children may prefer a milder version with less curry powder. Vitamin C is found not just in oranges but also in cauliflower. Cauliflower is also an excellent source of folic acid, potassium, and fibre. You can now get Nova Scotia-grown cauliflower with green, orange, and purple heads as well as the traditional white. Cauliflower is a member of the cruciferous family of plants, which also includes broccoli, cabbage, and Brussels sprouts.